In collaboration with the National Capital Commission (NCC), the Pontiac Equestrian Association has obtained the right to develop and open a first section of the Equestrian trail, along the Gatineau Park. Right now the trail goes from Lebrun Road, East, to Steele Line, West. Eventually, the goal is to open a second section from Lebrun Road to the Luskville Falls. The Association is responsible for maintaining and repairing the trail, a huge task accomplished with the help of wonderful volunteers. Funds to pay for the repairs are gathered through fundraising activities and the annual membership fees. 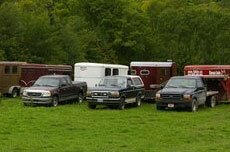 Where can you park a trailer? Parking has been graciously offered to the members on the property of Mr. Vaillant. From hwy 148, turn north onto Chemin Lebrun (the road next to the gas station), and drive up to the last barn, where our parking sign is posted. Place your membership card or daypass on your dashboard. Be aware that it's a private property where you park at your own risk. The equestrian trail being in the Gatineau Park, on NCC property, it is important to stay on the trail to avoid any damage to the surrounding ecosystem. 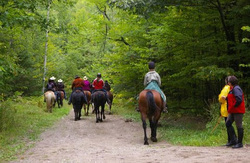 Riding in the Gatineau Park is a privilege given to the horse riders by the NCC and each and every member must respect the instructions and rules in place so that we can all continue to enjoy this wonderful experience. Always stay on the trail, do not ride in fields. Work is continuing on marking the trail. Posters like this one have been placed at some trailheads.